cleaned up line drawing, done in Adobe Illustrator. 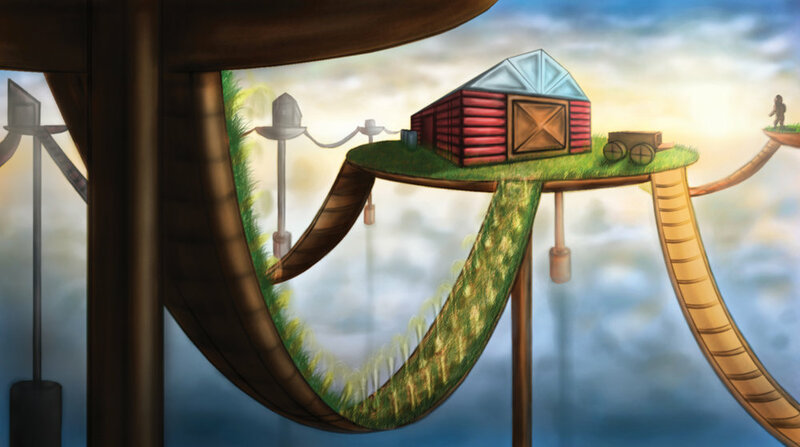 Done in Adobe Photoshop, concept of harvest barns on floating pods, vegetation belts & rail tracks for transporting produce using a swing mechanism that involves pendulum-motion, force of gravity & weight of wagon. Final rendering done in Adobe Photoshop. 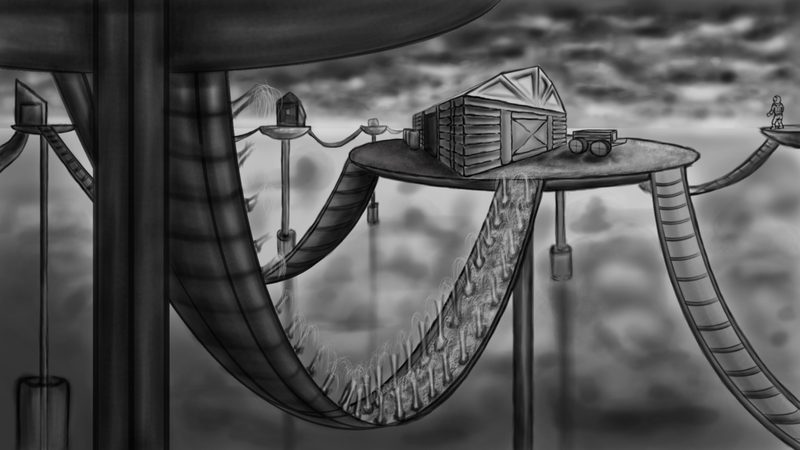 In this post-apocalyptic earth, the ground conditions are unfit for agriculture so these farm stations are suspended thousands of feet above ground. The barns are used for storing and processing grown food. Each pod is self sustainable by solar panels & glass roofing on the barns. 2 engineers regulate each pod, a pusher and a receiver. 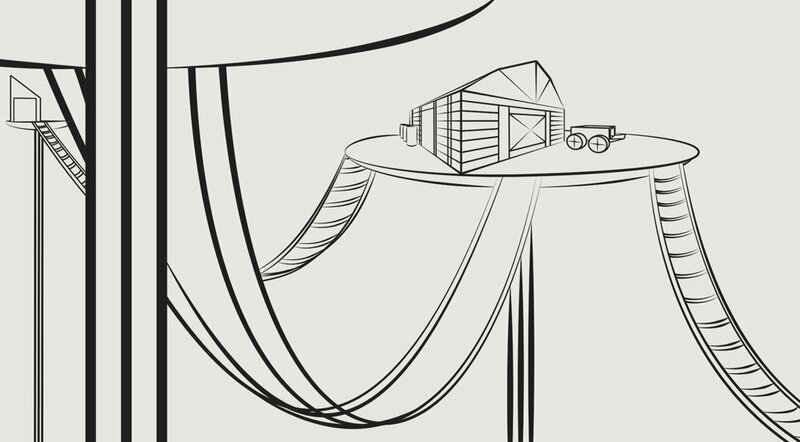 The pusher sends down a wagon that collects fresh produce on its way down the pendulum belt and a receiver on the connecting pod receives the wagon. The height of each bud determines if it is ready for harvest (tall enough to be picked up by the wagon). This way, only the fully grown buds are harvested during each swing. The wagon has a blade and an opening on one end so that harvest is made easy every swing cycle. Individual transportation by battery powered jet-packs. This concept is from a personal animation/live action project I'm working on. An info-graphic spreadsheet of the pentagon building, showing it's underground. The line work was built in Adobe Illustrator, to perspective and in bird's eye view. based on the sensitive nature of information, blueprints and plans, i decided to come up with a design and added the details in Photoshop. The gradient split-per-page for the spreadsheet helps the illustration standout and lets the colors pop more, the mid-grey tone keeps the first half of the text legible and the lighter grey neatly shows off design details of the building's construction. Rough line work done in Adobe Photoshop, clean up and perspective line drawing done in Adobe Illustrator. Layout placement and details added in Adobe Photoshop. Simple color and lighting added in Adobe Photoshop. Line drawing of opposite angles. This is the location created for a short story board for a cartoon animation, built in Adobe illustrator and details added in Photoshop. location concept art for a live action adaption of my comic book "To Return"